Adam Knecht is an associate attorney of the firm, practicing in corporate and transactional law, including civil litigation. Adam attended Brigham Young University for his undergraduate studies, receiving a Bachelor of Science degree with a major in Finance and Information Systems, and a minor in Spanish. He received his Juris Doctor from the William S. Boyd School of Law at the University of Nevada Las Vegas. 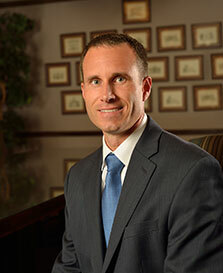 Prior to law practice, Adam had many years of management experience in both the technology and construction industries. Adam advised and provided management consulting services for various mid to large companies while working for Accenture. Subsequent to that, Adam was the general manager of a construction and development company. Adam is a long-time, active member of Habitat for Humanity and the Boy Scouts of America. Outside of work, Adam enjoys spending time with his wife and children, running, and hiking.